Did anyone else watch Crossbones? There's not really a lot I can say about this show. I could say a lot about the last two shows NBC put in this time slot - Dracula and Hannibal. Crossbones has some elements from both those shows. And John Malkovich. Like Dracula there are a lot of people with British accents running around in colorful clothes in a somewhat outrageous premise. Like Hannibal, the two main characters are warily engaging in a match of wits like "two sharks circling each other" as another character says. Both elements are executed adequately but don't really stand out. But let's be honest. The main draw of the show is John Malkovich. Like The Blacklist, the show gives a well known actor a license to chew scenery. But where James Spader cheerfully chews away like a kid with a Happy Meal, Malkovich chews a lot more slowly like he's dining in a fine restaurant. There was a reason NBC decided to dump this show into the summer season. The plot and characters aren't terribly noteworthy (though the actors doing the best they can with what they've got). 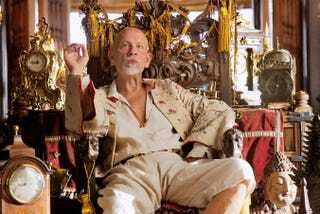 The only real reason to watch this show is John Malkovich so what you think of his performance will determine if this show is for you.